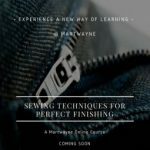 Learn how to start your clothing line with an in depth look at the clothing production process. Perfect for those who want to set up production units or outsource production. Distance is not a barrier. Learn from the comfort of your home. Please include your email address in the comment section.